Ask somebody to make a list of crimes and they will probably come up with the usual suspects that you or i would: murder, robbery, assault, burglary and so on. They might even include acts which are merely’against the law’ like parking on a double yellow line. But if you ask them to make a list of anti social behaviours, you are getting into an area where there is going to be considerable disagreement. This didn’t stop the UK government which introduced Anti-Social Behaviour Orders, or ASBOs, in 1998 as part of the Crime and Disorder Act – legislation designed to deal with practically all aspects of criminal activity and disorderly behaviour. A subjective definition of anti social behaviour permits you to cast your net wide and include anything you find personally disagreeable; the legal definition is also widely inclusive. To quote the Crime and Disorder Act it is behaviour which ’causes or is likely to cause harassment alarm or distress to one or more people who are not in the same household as the perpetrator’. This includes, among many other things, foul and abusive language, threatening behaviour, shouting, disorderly conduct, vandalism, intimidation, behaviour as the result of drug or alcohol misuse, graffiti and noise which is excessive, particularly at night. We still haven’t decided what constitutes anti-social behaviour. It doesn’t have to be physical violence, of course, but is far easier to identify and deal with if it is. What about threatening behaviour? We’re not talking here about direct threats such as ‘lf you come round here again. I’ll beat you up!’, but situations perceived as threatening. Let’s say a pensioner or a person of timid disposition is on their way home and they run into a group of young people who are shouting, swearing and kicking a ball about and who happen to make a few unkind . remarks as the person passes. Let’s say the person is alarmed or feels threatened by the situation. Does it merit getting the ASBO process going? In feet, young people merely hanging out in public places, however boisterous their behaviour might seem to be to some people, are not considered to be indulging in anti-social behaviour. However, there is a proviso. Such behaviour in its own right is not considered anti-social unless it is thought it is being done with other, more serious, behavioural attitudes involved. This, of course, can be very subjective. A person faced with an ASBO can argue in their defence that their behaviour was reasonable and unthreatening.This too is subjective, and both sides’ claims are open to wide interpretation. Something else that has to be taken into account here is that ASBOs are made on an individual basis even if that person is part of a group of people committing anti-social behaviour. If a case reaches the magistrates’court, witnesses can be called to provide further evidence for or against the defendant. However, the magistrate, as well as considering the complaints made against the defendant, will take into account his or her family situation, welfare issues, and whether or not he or she has been victimised or discriminated against It is worth bearing in mind, though, that witnesses can be intimidated or otherwise persuaded not to appear in court and give evidence. When the Crime and Disorder Act came into force, ASBOs were generally intended to be a measure to deal with adult anti social behaviour, yet within the Act it states that an order can be applied for against any individual over the age often years old. It is a striking fact that the majority of ASBOs imposed since the law was enacted have been handed out to young people and children. The question is, have they been effective? The government, naturally, claims that they have brought about a real improvement in the quality of life in communities around the country. Nay-sayers, such as civil rights campaigners, claim the measures are far too open to abuse. Some say they go too far and some that they don’t go far enough and lack bite. However, a genuine impediment to their effectiveness is that to impose an ASBO takes a lot of time and paperwork, involving the cooperation of community, police and local council, and they are very expensive to implement One estimate is that an ASBO can cost in excess of £20,000. What all this means is that ASBOs are being used very rarely in many parts of the country. So the jury is still out as to how effective they really are. Which THREE of the following statements are true of ASBOs, according to the text? A They were introduced to deal with specific crimes. B Parking on a double yellow line could get you served with an ASBO. C Swearing is one of the offences referred to in the Crime and Disorder Act. D Asa private householder you can apply for an ASBO against a noisy neighbour. E It is not illegal for young people to gather in groups in public places. 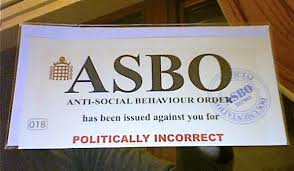 F An ASBO cannot be served on a group of people behaving in a disorderly manner. G A large proportion of those served with ASBOs are over the age of 21. H Most people agree that ASBOs have been effective all over the country. A anti-social behaviour should be seen as a crime. B few people agree on how to define a crime. C anti-social behaviour is difficult to define. D the legal definition of crime is too exclusive. 5 What surprised the writer about the imposition of ASBOs? 6 In the writer’s opinion, how effective have ASBOs been? A There isn’t enough evidence to decide. B They are too expensive to be effective. C They are ineffective because they are not strict enough. D Being open to abuse renders them ineffective. Answer: definition says that anti-social behaviour is behaviour which can cause alarm or distress. Answer: excessive noise is considered anti social behaviour. Answer: civil law rather than criminal law. Answer: make a complaint to either the local council or the police before any action can be taken. Answer: witnesses/neighbours/acquaintances to get more information. Answer: Physical violence is the most straightforward form of anti-social behaviour to determine.